Cranberry Pistachio Christmas Shortbread Cookies is delicious and easy Christmas dessert recipe with only few ingredients: butter, sugar, flour, dried cranberries and pistachios. These holiday shortbread cookies are a fun twist on classic Christmas treat-Easy Shortbread Cookies Recipe! Just add chopped cranberries and pistachios in classic shortbread cookie dough and you’ll get delicious and festive looking dessert! Shortbread cookies are Christmas staple. They are super easy to make with only three ingredients: salted butter, powdered sugar and flour. You can add a hint of vanilla or almond extract, but they are delicious and buttery, even without that. However, you can make so many variations starting with classic shortbread cookie dough. Check these Christmas Maraschino Cherry Shortbread Cookies with chocolate chips and maraschino cherries and these White Chocolate Strawberry Shortbread Cookies with dried strawberries and white chocolate chunks, too. For this holiday season I have new recipe, Cranberry Pistachio Christmas Shortbread Cookies cut out in the shape of Christmas trees. Cute Christmas trees speckled with red cranberries and green pistachio pieces are perfect Christmas cookies!!! 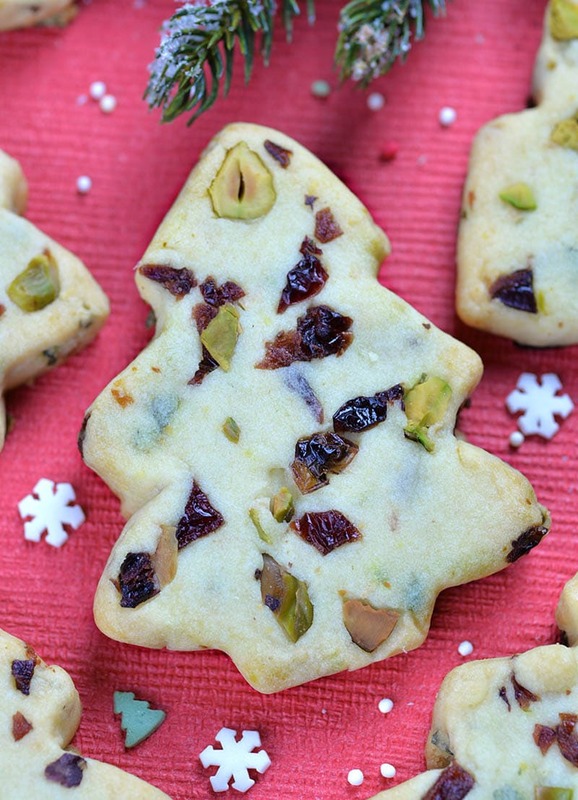 I’m sure Santa would love to grab a few of these Cranberry Pistachio Christmas Shortbread Cookies too, when he stops by to deliver the Christmas gifts. Cranberry Pistachio Christmas Shortbread Cookies are perfect snack for kids with a mug of warm cocoa and delicious treat alongside a cup of coffee or tea for adults. 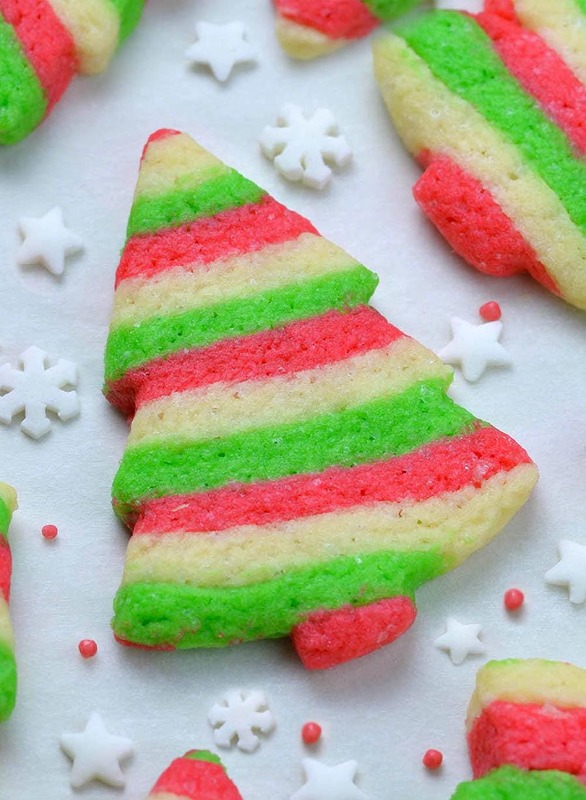 Christmas tree cookies are perfect gifts for the neighbors and great choice for cookie exchange! Everyone will love them. 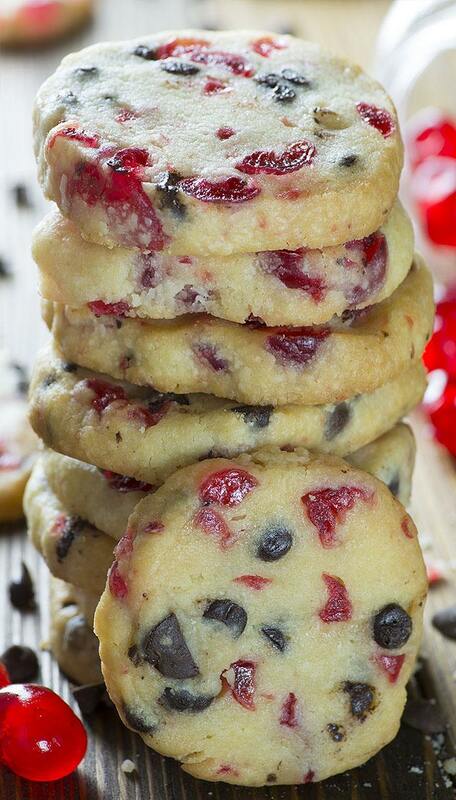 How do you make Cranberry Pistachio Christmas Shortbread Cookies? 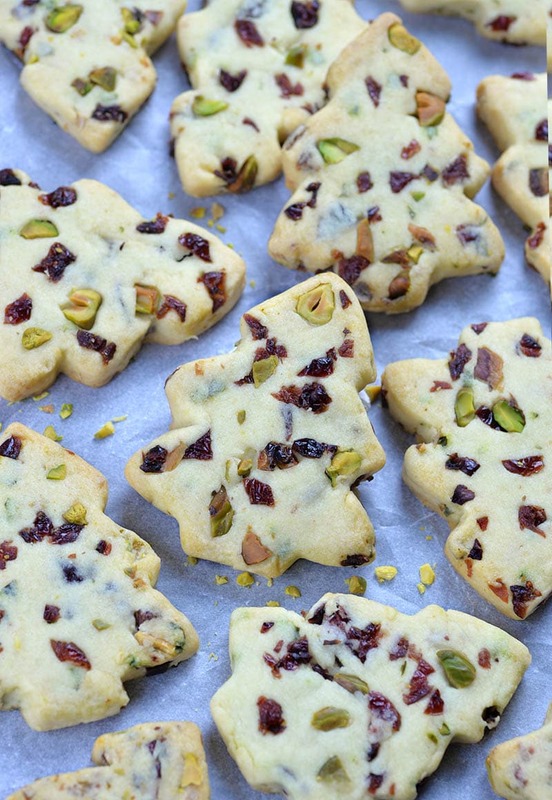 Cranberry Pistachio Christmas Shortbread Cookies are super simple and easy to make. First beat 1 cup of softened unsalted butter with ¾ cup of powdered sugar and 1 teaspoon of vanilla extract just to combine. Then add flour and mix until everything is incorporate. The mixture will look crumbly or sandy at this point. Now you should add chopped cranberries and pistachios. Mix for a few seconds, then knead it just a few times with your hands, to come together. Form a disk and wrap with plastic foil, then chill for an hour in the fridge. When ready to bake the cookies, preheat the oven to 325 F and line baking sheets with parchment paper. Then, roll the dough about 1/3-1/4-inch thick and cut out the Christmas trees. Arrange them on baking sheet leaving 1 inch space apart. When baked, they are nearly white, or a light golden brown. They may be crumbly right after baking, but they will become firmer after cooling. Cute Christmas trees speckled with red cranberries and green pistachio pieces are perfect Christmas cookies. Beat room temperature butter, powdered sugar and vanilla. Gradually add flour and mix to combine. Do not mix too much. The mixture will look crumbly. Mix in ½ cup chopped cranberries and ½ cup chopped pistachios (see step 6.) Then, knead it just a few times with your hands until mixture come together. Form a disk, wrap with plastic wrap and chill 45-60 minutes. Roll out the dough 1/3 inch thick. 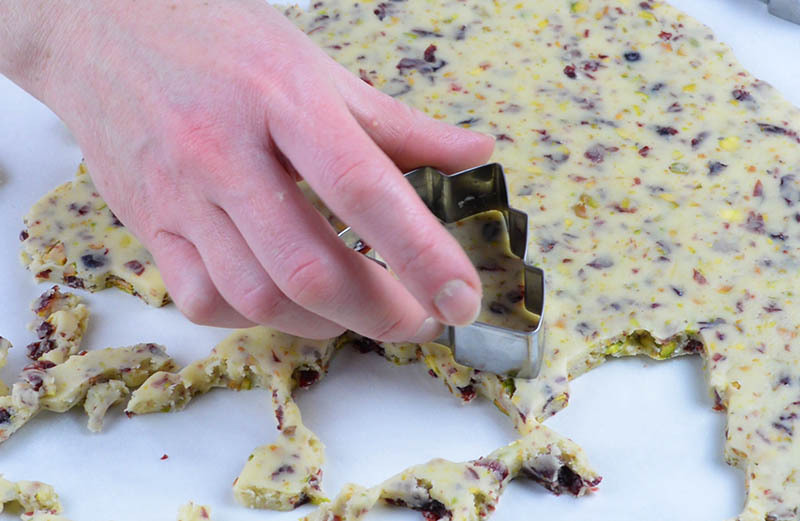 Sprinkle remaining cranberries and pistachio on top and gently tap with your palms or gently roll with a rolling pin just to form a flat surface. 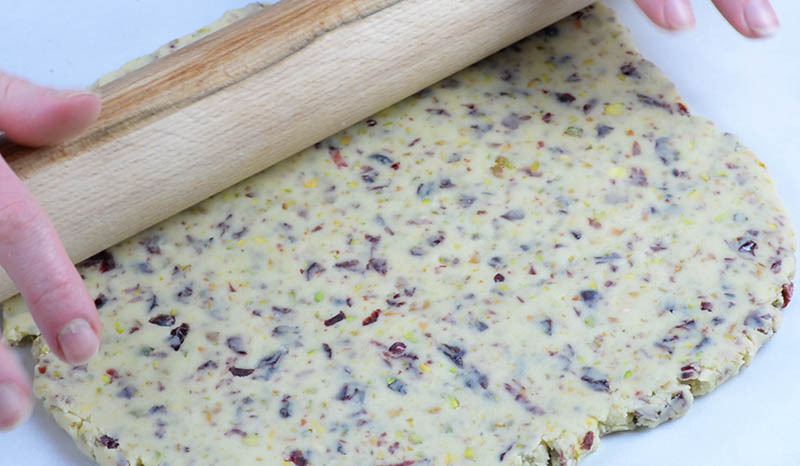 You can skip this step and add all of the cranberries and pistachios in the dough, but this way the cookies will look prettier. Next, using Christmas tree shaped cookie cutter, cut out the cookies. If the edges look crumbly because of the cranberries and pistachios shape it gently with your fingers. Bake at 325 F until the edges are lightly golden brown (18-20 minutes). They may be crumbly right after baking, but they will become firmer after cooling. I tried and didn’t result well, the doughnut was too dry, impossible to roll, i should work it a lot and even then use cutters was not an option with the pistachios and the cranberries… I will not do them again. This recipe didn’t work for me at all. It was way to dry. It needs more butter to hold it together. I really wanted these as I thought not only were they pretty but they were a different combination of ingredients. Not all was lost….I rolled the dough into balls, rolled in sugar then after placed on cookie sheet I smashed them with the bottom of a glass. I baked at 325 for 15 minutes. As soon as I removed them from oven I placed a few semi sweet chips on them. Once melted I spread the chocolate and sprinkled with the remaining nuts and a few cranberry pieces. Last I sprinkled with a little sanding sugar. I put in fridge for 10 minutes for chocolate to set. They are still a bit crumbly. Wow, this was so dry it’s ridiculous. Everything just fell apart and was a huge mess. I should have read other comments first.